The Vision for the Ohio & Erie Canalway is a product of a public process that occurred through a series of meetings held from 1997-2000. That Vision is captured in the “Corridor Management Plan (Plan)”. The Plan painted a future where people would actively explore the region’s package of natural, cultural, historic, and scenic resources, using one of three transportation options: (1) the designated and signed auto route – America’s Byway; (2) the Cuyahoga Valley Scenic Railroad; and/or (3) the Towpath Trail SYSTEM. The Towpath Trail System was conceived as a network of trails connecting to the Towpath Trail and packaged as a system. Each county in the Canalway has accepted this Vision and is planning/building such connections as pieces of overall county trail planning. In Cleveland, the Vision recognizes a number of connector trails: Mill Creek, West Creek, Big Creek, Red Line Greenway, Lake Link (Cleveland Foundation Centennial Trail); Walworth Run/ Train Avenue; Treadway Ravine; Morgana Run; and the Slavic Village Downtown Trail. The Cleveland Foundation Centennial Trail, formerly known as the Lake Link Trail, is a Towpath connector trail. The trail currently takes cyclists and pedestrians from Scranton Flats to near Rivergate Park on Columbus Road. The Trail will eventually connect to Wendy Park. The Cleveland Foundation Centennial Trail utilizes two new bridges to cross Scranton Road and train tracks on its way from Scranton Road to Columbus Road. 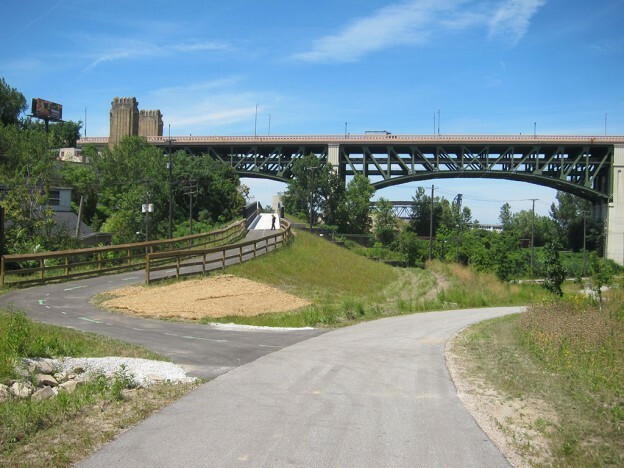 The Trail opens up some cool new views of the city and connects the Towpath to recreation options such as Merwin’s Wharf, the Crooked River Skatepark, the Cleveland Rowing Foundation and the future academic rowing center, the Foundry. The Mill Creek Connector Trail lets riders, walkers and joggers experience the Mill Creek Valley though an all-purpose trail that crosses the Mill Creek via a bridge, conquers tough elevation changes with a switchback and features great views of the Mill Creek and Cuyahoga River valleys. The Mill Creek Connector Trail goes from the Towpath Trail in the Ohio & Erie Canal Reservation, through Bacci Park and to the intersection of Warner Road and Garfield Boulevard. There dedicated bike lanes are planned within the right-of-way of Garfield Blvd to connect to the Garfield Reservation and Mill Creek Falls. The first phase of the project was completed in Bacci Park in 2007. The second phase of the project, built by the Cleveland Metroparks opened in 2016. The Mill Creek Connector trail has been the beneficiary of three grants provided through the Canalway Association’s Strategic Grant Program as well as transportation alternative funding from NOACA. Shortly after Moses Cleaveland left to return to Connecticut, the center of settlement shifted locally to Newburgh Township, an area distinctive for one natural reason – its waterfall. In 1820, when Cleveland and Ohio were in heavy discussions/negotiations for the construction of the Ohio & Erie Canal, Cleveland had but 500 residents; Newburgh Township boasted 1,500. Mill Creek Falls is Cleveland’s only waterfall. It falls some 45 feet and may be Cleveland’s best kept secret – hidden for decades when rail tracks were moved off Broadway Avenue and later Broadway/Warner roadways built over the tracks. Before 1990, the waterfall has “out-of-site/ out-of-mind.” Surrounded by construction yards and abandoned buildings crying for reinvestment, the Falls was the place where kids went to find trouble. The Broadway/Warner/Turney cloverleaf was a traffic disaster with freeway-like signage hovering above Broadway Avenue, terrible sightlines as drivers rose onto Warner Road and sharp, ill-defined turnouts marking Broadway and Turney Avenues. 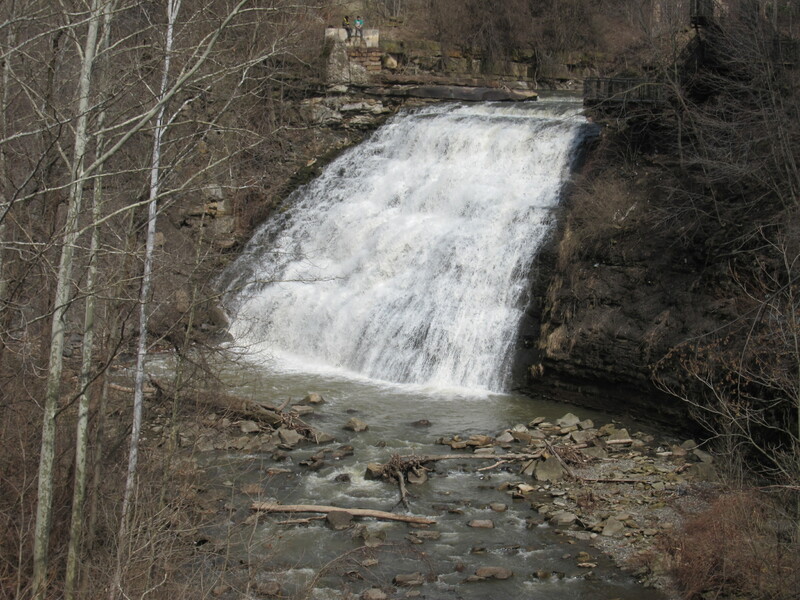 In the early 1990s, Mill Creek Falls was rediscovered – first in the seminal North Cuyahoga Valley Corridor Study, authored by Rick Sicha of the Cuyahoga County Planning Commission, and afterwards in a new community development project initiated and led by Slavic Village planner Bobbi Reichtel. Today, the Mill Creek Waterfall is a different place. It offers an oasis in the midst of a dense and busy urban thoroughfare. (They haven’t fixed the traffic problems, yet – but they’re working on it.) The construction yard is gone as is the cluttered gas station that marked the intersection of Warner and Turney Roads. A park is growing, spreading around the Mill Creek Falls. Its footprint has extended down and along Broadway Avenue, inching towards the historic center of the historic Newburgh Township, now marked by the historic Carnegie Library Building. The Mill Creek Falls area now includes overlooks and underlooks of the Falls, interpretive storyboards, picnic areas, and a History Center. The Mill Creek Falls History Center is housed in the historic Brilla House overlooking Mill Creek Falls in Old Newburgh, in Cleveland, Ohio. It is operated by the Slavic Village Historical Society and welcomed its first guests the weekend of October 12th-13th, 2002. Regular monthly meetings of the Slavic Village Historical Society are held here. The Ohio & Erie Canalway boundaries in Cuyahoga County stretch to include the developing West Creek Preserve which follows the course of West Creek from Parma through Seven Hills, Brooklyn Heigths and Independence before it empties into the Cuyahoga River. The idea to create a greenway park was first explored by Cleveland Metroparks in their original “Emerald Necklace” plan. Later, in 1984, Tom Yablonsky, a Parma resident, and Jeffrey Lennartz , founders of Canalway Partners, met with Mayor Petruska of Parma in the role of planning consultant for Planning Resources and reintroduced the idea. Tom recalls that, “Mayor Petruska held a personal affinity with the area as he swam and fished West Creek as a child.” Councilman Michael Reese was truly excited about the prospect and included the idea in his mayoral campaign. His untimely death prevented any action when he became mayor unfortunately, through the unusual set of circumstances, the idea did not find the necessary traction to move it ahead. In 1989, when the County Planning Commission was preparing the seminal North Cuyahoga Valley Corridor Study (NCVC Study, 1992) , there was a decision to draw a tight boundary line at the interface of the Cuyahoga Valley National Park in Valley View, precluding the inclusion of West Creek into the study area. The rationale here was that Valley View had experienced a loss of property through acquisition of parcels to create the National Park and that experience had not been forgotten nor forgiven at that time. Since the original feasibility study conducted by the National Park Service relied on the Cuyahoga County Planning Study for its basis, that document, Route To Prosperity (1993), also failed to alter the boundary provided in the North Cuyahoga Valley Corridor Study, despite objections by Canalway Partners. Fortunately, the true boundary exercise was conducted within the Corridor Management Plan (2000). Between the timing of the County’s NCVC Study and the onset of the Corridor Management Plan (1998), a new organization emerged in Parma to advocate for a West Creek Greenway. Dave Vasarhelyi, Sue Zurovchek, Dave Lincheck, and Jeff Lennartz led the early efforts for the West Creek Preservation Committee. In the beginning, they approached Canalway Partners to act as their fiscal agent until they cleared the necessary hurdles imposed by the IRS. We were honored to do so and play a small part in their birth as an organization. Their history of accomplishment has been nothing short of remarkable. They led the voters of Parma through 2 successful ballot initiatives that resulted in a community consensus that the West Creek Greenway was important to the future of their community (not a golf course) and a local tax whereby Parma citizens raised $3 Million to purchase the Gannet Property along West Creek. They have worked successfully with a number of organizations, including Cuyahoga County Planning Commission, Cleveland Metroparks, Cuyahoga RAP, Ohio EPA, State of Ohio, Cuyahoga NRAC, Northeast Ohio Regional Sewer District, and the 4 cities and villages within their watershed to develop plans, find funds to purchase properties adjoining the creek. Cleveland Metroparks has evaluated the offer to absorb this new greenway into their system and responded positively following a series of public meetings with Parma residents. While neighborhoods surrounding most of the nine-mile West Creek are densely developed, this 324-acre reservation preserves a valley of rocky gorges, forest-draped hillsides, floodplains and babbling brooks. The West Creek watershed has influenced settlement and development patterns for two centuries. Remnants of abandoned quarries and the comfortable homes of quarry owners can still be found in the watershed today, which drains the cities of Parma, Seven Hills, Brooklyn Heights, Independence and portions of North Royalton and Broadview Heights before emptying into the Cuyahoga River. West Creek Reservation invites the cyclist, hiker, picnicker and birdwatcher to a varied upland and wetland landscape. Nesting birds include red-tailed hawks, wood ducks and screech owls, and migratory species such as American redstart, indigo bunting, Lincoln’s sparrow and great crested flycatcher can be found there as well. Perhaps the most exciting aspect of West Creek Reservation is the discovery of new urban watershed stewardship techniques. The developed and restored natural areas of the reservation are a living laboratory supplying data and demonstrating real-world solutions for stormwater and pollution control. Not only has Cleveland Metroparks embraced the concept and has stepped up to play a management role in what is now the West Creek Reservation, but they partnered with West Creek Committee and the Northeast Ohio Regional Sewer District to introduce the West Creek Stewardship Center. 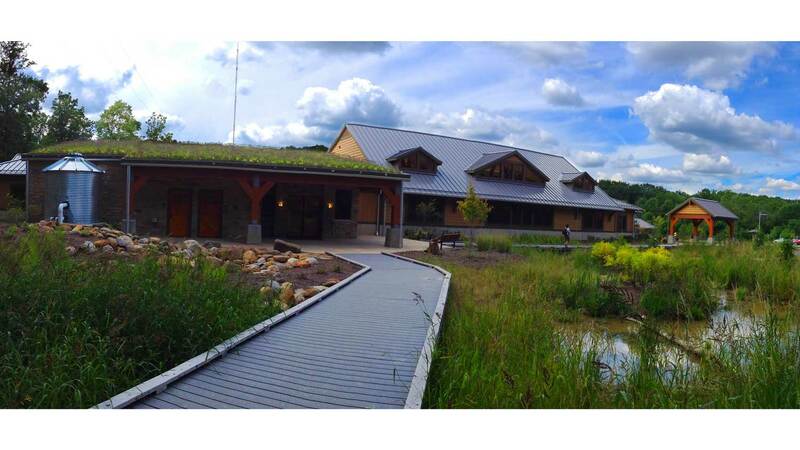 The Watershed Stewardship Center in West Creek Reservation, staffed by natural resource and education professionals, land protection specialists, volunteers, and visiting scientists, is the first facility in Cleveland Metroparks dedicated to scientific research and promoting sustainable action.